Over 30 artists from Canada and around the world have been handed the keys to the former Saint-Louis-de-Gonzague school on MacKenzie Street near downtown Sudbury. From the weird to the wonderful, there's no shortage of creativity currently on display at the sixth Fair of Alternative Art in Sudbury. More than 30 artists from across Canada and different parts of the world are in the Nickel City for the event. They've been handed the keys to the former Saint-Louis-de-Gonzague school on MacKenzie Street. The building has been closed and generally in disuse for many years. But the public can currently explore the old school and peer into the various rooms. 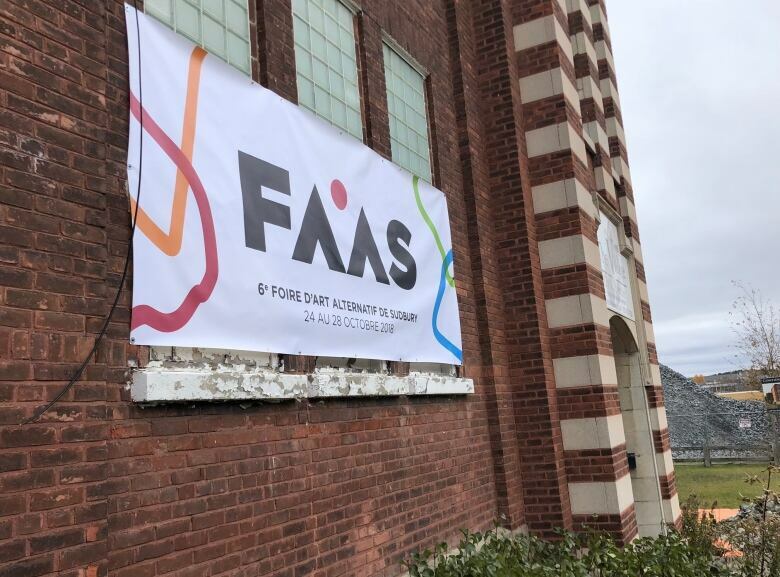 "They can go from one floor to the other and see what the artists are doing while they're creating," explained Danielle Tremblay, the executive director of the Galerie du Nouvel-Ontario which puts on the fair every two years. "What the public will be seeing, they'll be able to visit the school — it's been closed to awhile, and I think there might be some curiosity around that also." Tremblay said there are Canadian artists from Moncton to Calgary on hand. But there are also participants from France, Finland and Cameroon, giving the festival its first truly international flavour. She explained the fair's theme, "À qui?" — which translates to, "To whom?" — revolves around questions about territory and space. 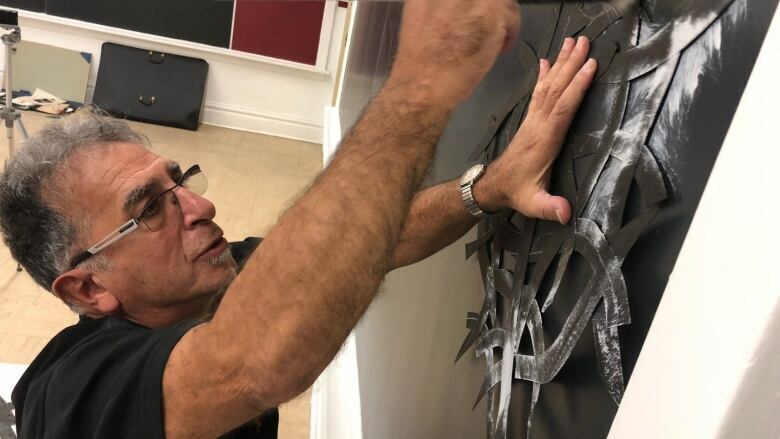 Toronto-based visual artist Joseph Muscat has a room of his own to create in the former Saint-Louis-de-Gonzague school near downtown Sudbury. He's using stencils and black and white paint to create shapes on the walls around him. He explained that would be the backdrop to another central piece in the middle of the room, but he couldn't given many more details. "There's always that element of surprise, which I really really like, because if I knew what it was going to look like, there would be less excitement," explained Muscat. Muscat chuckled as he placed himself on the "more traditional side" when it comes to visual arts. He said he's keen to explore what some of the other artists around him are working on. He pointed out that in a classroom next door, his neighbour has decided to build a swimming pool. Another artist has placed microphones to capture sounds around the old building for an audio project. Muscat defined what alternative art means to him. "'Alternative' means you're doing something nobody else is doing, or at least you're not staying in the trend, whatever that trend is," he offered. "In 2018, I dare say there isn't a trend in art anymore and there hasn't been for a long time. "So you really have to dig deep to find something today that nobody else as done, and that's a good idea, because it challenges people to not go by any rules or any past things, but to come up with their own." Public viewing hours on Friday are set from 1 to 8 p.m. The doors will open again at 11 a.m. on Saturday, with final works scheduled to be revealed at 6 p.m.